I also want to introduce myself to you. My name is Anne Kinsky, I’m married and are mother of two boys. 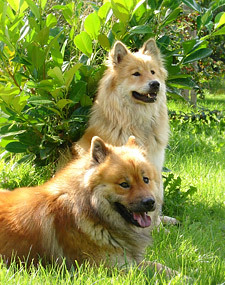 The Eurasier couple Bo Daddy vom Nordertor and Oshi mae von der kleinen Blaike belong to our family. Bo Daddy and Oshi mae"
One of my hobbies I want to share with other interested dog owners: All collected or self created play ideas for a varied and cheerful gathering with our dogs, which you perhaps found already at another (point of this website). For each character and every weather you will find something. 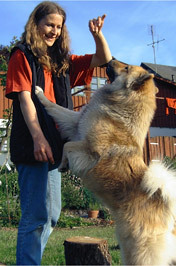 All mentioned playing sequences are approved by fourlegged incorruptible critics and they found them o. k.
And as the Eurasier like varieties we don’t want to introduce to you not only some different games, but want to include your special ideas, dear dogfriends. So that a variable number of games for indoor and outdoor playing either for the surroundings or for the city will be completed. You have further ideas for games and perhaps some photos? You have questions to the a. m. ideas? You have questions concerning this headline? Please ask, we surely will find solutions all together. You have nice playing ideas for our collection or questions to special games? I enjoy to get your reply.